On January 9, 1847, the Polynesian reported there were 1,386 buildings in Honolulu, 1,337 of these were residences: 875 made of grass; 345 adobe; 49 coral; 49 wood and 29 stone/coral below, wood above. Washington Place was built that year by future-Queen Liliʻuokalani’s father-in-law. Excluding visiting sailors, foreigners made up only some 6 per cent of Honolulu’s approximately 10,000-residents. Following a road realignment program directed by Kuhina Nui Kīnaʻu (Kaʻahumanu II) to straighten out the streets, Honolulu was linked by four “big paths” or alanui: Beretania and Queen bordered it in the north and south and Alakea and Nuʻuanu defined its eastern and western limits. Nearly two-decades before (about 1830,) Queen Ka‘ahumanu ordered that a wall be built in the Makiki area to keep cattle from the inland residential areas. The stone wall also marked a path across Makiki which was first called Stonewall Street; this former path is now covered by Wilder Avenue. Beyond Honolulu’s limits there were few residences other than the grass houses of Hawaiians. The population was growing toward and up Nuʻuanu, but Honolulu was hemmed on the Diamond Head end by the barren plains called Kulaokahuʻa. Kulaokahu‘a was the comparatively level ground below Makiki Valley (between the mauka fertile valleys and the makai wetlands.) This included areas such as Kaka‘ako, Kewalo, Makiki, Pawaʻa and Mōʻiliʻili. This flat plain would be a favorable place to play maika, a Hawaiian sport which uses a disc-shaped stone, called an ‘ulu maika, for a bowling type of game. Pukui states that the name makiki comes from the type of stone used to make octopus lures. This is the same type of stone that was used to make ‘ulu maika, and some have speculated that the name of the ahupua‘a (Makiki) may have originated from its association with the maika sport rather than, or addition to, the making of octopus lures. There were several horse paths criss-crossing the Kulaokahu‘a Plains. 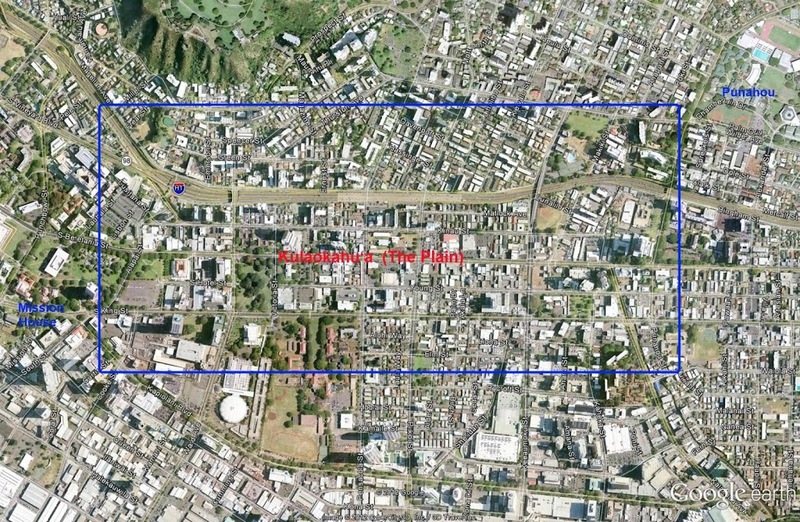 In the 1840s, it was described as “nothing but a most exceedingly dreary parcel of land with here and there a horse trail as path-way.” (Gilman) The flat plains were also perfect for horse racing, and the area between present-day Piʻikoi and Makiki Streets was a race track. The Plains were described as dry and dusty, without a shrub to relieve its barrenness. There was enough water around Makiki Stream to grow taro in lo‘i (irrigated fields,) and there was at least one major ʻauwai, or irrigation ditch. Between the years 1850 and 1860, nearly all the desirable Government land was sold, generally to Hawaiians. The portions sold were surveyed at the expense of the purchaser. (Interior Department, Surveyor’s Report, 1882) Most of the Kulaokahuʻa lands were not included. Clark noted that “the settling of the Plains did not come until the 1880s, after water was brought from Makiki Valley.” Kulaokahu‘a became more hospitable when water became available from springs and artesian wells, and would gradually be transformed into an attractive residential district in the 1880s. Never-the-less, in 1892, Thrum noted that to get to Mānoa “for nearly a mile the road leads by or along pasture fields with no visage of tree or shrub other than the lantana pest … and passes along Round Top of Ualakaʻa”. The image shows the general area of Kulaokahu‘a (The Plains) – noting Punahou School and Mission Houses. In addition, I have added other related images in a folder of like name in the Photos section on my Facebook and Google+ pages. Before the foreigners arrived, Hawaiians had a vocational learning system, where everyone was taught a certain skill by the kahuna. Skills taught included canoe builder, medicine men, genealogists, navigators, farmers, house builders and priests. The arrival of the first company of American missionaries in Hawaiʻi in 1820 marked the beginning of Hawaiʻiʻi’s phenomenal rise to literacy. The chiefs became proponents for education and edicts were enacted by the King and the council of chiefs to stimulate the people to reading and writing. In 1831, Lahainaluna Seminary, started by missionary Lorrin Andrews, was created in Maui to be a school for teachers and preachers so that they could teach on the islands. The islands’ first newspaper, Ka Lama Hawaii, was printed at this school. Hilo Boarding School opened in 1836, built by missionary David Lyman, a missionary. Eight boys lived there the first year. This school was so successful a girls’ boarding school was created in 1838. The school was created by King Kamehameha III, and at his request was run by missionaries Mr. and Mrs. Amos S. Cooke; the main goal of this school was to groom the next generation of the highest ranking chief’s children of the realm and secure their positions for Hawaiʻi’s Kingdom. The Chiefs’ Children’s School was unique because for the first time Aliʻi children were brought together in a group to be taught, ostensibly, about the ways of governance. The School also acted as another important unifying force among the ruling elite, instilling in their children common principles, attitudes and values, as well as a shared vision. Kamehameha III called for a highly-organized educational system; the Constitution of 1840 helped Hawaiʻi public schools become reorganized. “Statute for the Regulation of Schools” passed by the King and chiefs on October 15, 1840. Its preamble stated, “The basis on which the Kingdom rests is wisdom and knowledge. Peace and prosperity cannot prevail in the land, unless the people are taught in letters and in that which constitutes prosperity. If the children are not taught, ignorance must be perpetual, and children of the chiefs cannot prosper, nor any other children”. The creation of the Common Schools (where the 3 Rs were taught) marks the beginning of the government’s involvement in education in Hawaiʻi. At first, the schools were no more than grass huts. The 1840 educational law mandated compulsory attendance for children ages four to fourteen. Any village that had fifteen or more school-age children was required to provide a school for their students. Oʻahu College, later named Punahou School, was founded in 1841 on land given to missionary Hiram Bingham by Boki (at the request of Kaʻahumanu.) Bingham gave the land to the mission for the school. The government-sponsored education system in Hawaiʻi is the longest running public school system west of the Mississippi River. To this day, Hawaiʻi is the only state to have a completely-centralized State public school system.